On March 22, California’s Great America unveiled the rolling stock for their highly anticipated coaster, GOLD STRIKER! ACE NorCal was on hand to check it out and on the right we have a video giving you a special look. At this special event, the car was not only revealed, but I also had a chance to take a seat in it. I am happy to report the GCI cars are as comfy as always! Check the video below for a 360 degree tour of the car, along with a photo of me in it! 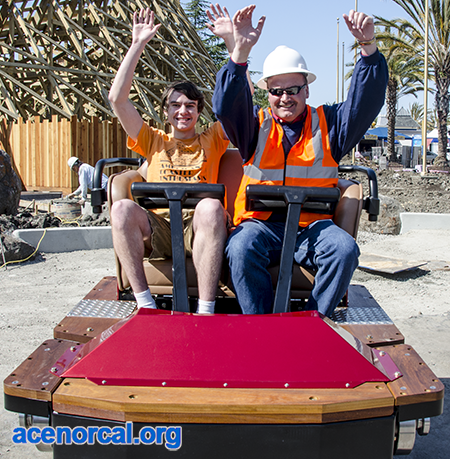 ACE NorCal Assistant Regional Rep. Nicholas Laschkewitsch sits in a Gold Striker car with Great Coasters International, Inc. (GCII) President, Clair Hain Jr. ACE NorCal assistant regional rep.